The offering is centered around the eXtensible Business Reporting Language (XBRL). This is a comprehensive format for exchanging financial information between parties. Each XBRL document is a financial report of some type. Think of it as a spreadsheet full of values. Normally the problem with a spreadsheet is while a number (e.g. $2,534,210) is completely clear, but what exactly this number represents is not so clear. Specifying which kinds of values are included in this number, what time period it is for, geography, or which parts of the company has to come separately from the number itself. That is where the taxonomy comes in. Part of XBRL “filing” is a set of associated documents that define the terms both descriptively and mathematically. The root taxonomy is produced by regulatory agency, and so all companies have to comply with these meanings, but industries and individual companies can extend the taxonomies in order to report thing that are specific to their business, and not just the things common to every business. Furthermore, each value reported is associated clearly with a point in time, or a time period, and potentially a specific region. The result is a complete definition that can be automatically read and understood by the receiver. The XBRL format has revolutionized the US Securities and Exchange Commission which adopted XBRL a few years ago, and today all 15,000 publicly traded companies must report their figures to the SEC in XBRL format. The SEC then automatically receive this information, and because the semantic definition of the figures is available, extract those figures that it needs, and can compare companies to each other on an apples-to-apples basis. At the same time, this has opened up a a large potential for analytics across industry sectors, because these reports are freely available from the SEC to analysts, who can easily consume the reports, and use the values. XBRL greatly improves the efficiency of monitoring public companies. Not only in the US, XBRL is being widely adopted in Europe as well, where the European Union’s European Banking Authority (EBA) requires reports from the other central banks to be delivered in XBRL format, and the EIOPA, the European insurance industry regulator, has also stated that insurance companies, under Solvency II regulation, will have to submit their first interim reports in XBRL most probably from the beginning of 2016. Fujitsu has been a leader in the XBRL space, playing a key role in the creation of the standard. Fujitsu’s product, Interstage XWand, is recognized as a leading product in the marketplace. The other key ingredient is Fujitsu’s Trusted Public S5 cloud which is a high availability high security cloud hosting environment that is able to handle this kind of application. XWand Cloud bring these together in a free offering that spotlights both products. When submitting a financial report to the SEC, the one thing that financial filers want to know is whether the entire report is valid according to a set of standard validation rules. XWand can do this. Marked as a “beta” the offering is currently modest. 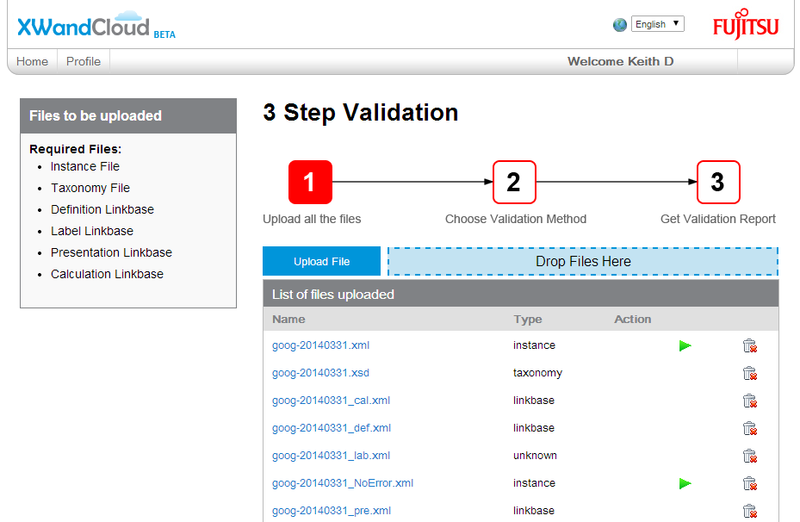 Users can register for a free account in order to easily and quickly upload their reports to XWand Cloud and get a thorough validation check. The resulting report pinpoints where the problems in the document are, if any. If the filing is proper and complete, the report will show a cleam bill of health. Fujitsu is not saying anything about where this is ultimately headed, but the cloud based platform opens possibilities for collaboration around the reports, possibly reviews and approvals, as well as selective distribution of the information to third parties. There is a growing community of XBRL suppliers, and XWand Cloud could be a meeting place where such parties can offer specialized services. I have been saying for a while that the correct way to integrate ICT systems from different companies is to exchange documents that are a fully self-describing in the way that XBRL is. Because the XBRL document comes with the precise semantics described by the taxonomy, the standard service oriented architecture problem with “API versions” is avoided. The two parties must agree on the standard taxonomy (set by the regulatory agency or possibly an industry authority) but they then map these values into their own independent systems. What we are seeing is beginning of true integration of financial systems across organizations. I believe that use of XBRL will expand beyond the financial field. The same technology could be used to describe ust about anything, for example giving product information to an e-commerce store, product materials definitions for a outsourcing, descriptions of services that might be provided and exchanged, etc. This approach will allow looser, and more complete, integration across many fields. Who knows where it will go? XWand Cloud is a small step in this direction, bringing Fujitsu’s Interstage XWand capability together with Fujitsu’s cloud offering. This entry was posted in Cloud, XBRL and tagged cloud, knowledge work, standards. Bookmark the permalink. A really good positive step. Already there are companies like mine offering services on top of XWand cloud, check out Apurba Technologies Lyticas Prism Cloud. XBRL software helps us to create company financial sheet in suitable format.